Feeling refreshed from our overnight stay in Helper, Utah we headed further south into the Canyonlands of Utah and Arizona. The desert further north was a white sandy color- salty, like the Great Salt Lake. But as we headed south we saw splashes of rusty red and burnt orange, which started to color the cream-colored rocks and ground. It looked like god used a giant brush to paint flamboyant strokes on a very blank canvas. As the color popped out at intervals, it gave us a feeling of excitement and we started to imagine what the Moab Desert would look like. We looked at the temperature on the dashboard and watched it steadily rise to 42°c, the Canyons started to appear in the distance. At 44°c, the color of the desert was transformed to red, with only a few light green and yellow desert shrubs to contrast. At 46°c, a steep winding road lead up the red mountain. We had finally arrived. The road to Arches National Park was the Moab’s desert counterpart to Independence pass in Colorado. 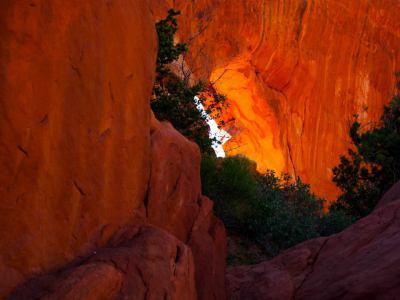 We wound our way high up, peering down at the sheer orange drops and when we arrived at the plateau we looked up at spectacular rock windows and natural bridges--the monuments that gave Arches National Park its name. It was incredible to see how such a formidable and desolate place could create such an awe-inspiring and captivating world. As soon as it was possible we pulled up next to a multi-colored wave of rock and squeezed our way into cool crevices to take pictures and hide away from the intensity of the sun. When we were ready to see more, we headed up to the windows, a walk that was barely a quarter mile, but in which the harsh sun still managed to melt us into wet cookie dough. More than you could ever imagine. 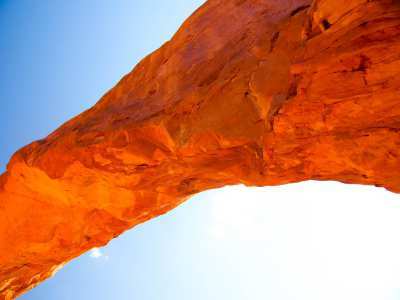 Bright orange bridges cut across piercing blue skies which created an astonishing display of natural color and contrast. If you looked straight out through an archway, you could see snow-capped mountains in the distance, far, far away, that strangely rose out of a desert floor. I enjoyed sitting in the shade of the natural window and burying my feet in the red sand whilst looking out at the view. We ambled along archways and slid into rock chambers, avoided steep falls as we crossed narrow bridges and took photographs from strange perspectives and angles. We even managed to drag ourselves uphill to see the delicate arch, which was perched on the edge of a canyon and where there was a steep drop down into a red abyss. We saw a crescent moon in the sky even though it was the middle of the day. 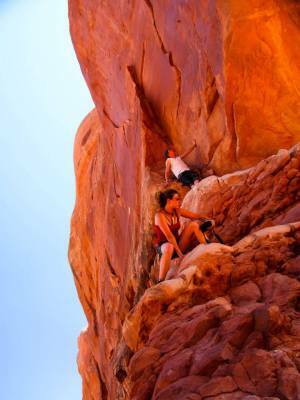 Once the vultures started to circle our cooking carcasses we thought it best to head into Moab town and have a few drinks and a couple of rounds of pool before heading through a sparkling desert night into Canyonlands National Park. The next morning we awoke to an outstanding view.